A jade-coloured rectangular box is laid delicately and ceremoniously on the table; hidden inside lies another treasure of the Wordsworth Trust. Our little group – enthused students of Romanticism – have already been shown a first-edition copy of the Lyrical Ballads – ‘shown’ because the book is considered so valuable as an object that it is forbidden to touch, let alone open. What wonder could await us in this jade box? To my surprise, and rush of pleasure, the box is opened to reveal something apparently far less grandiose: a red leather travel notebook. Its cover is not simply ‘red’: it is rather a variegated motley of hues, a base rose colour overcome with deep patches of cherry, even shades of mahogany. This patchwork of colour; the book’s rough edges; the white wrinkles creasing its folding flap and webbing across intermittent areas of the cover combine to create the impression of a well-worn, weather-beaten journal. This travel notebook, we are informed, belonged to William Wordsworth. It contains fragments of verse written between 1797 and 1800. Its cover immediately evokes outside space, just as the nature of the object’s materiality as a travel journal implies that the ideas and thoughts recorded within it have been inspired by the outside world. Having studied William’s poetry for several years now, I am well-versed in his great love of nature; I was thus struck by the idea of William wandering outside with this notebook by his side, ready to jot down poetic musings. Indeed, Rebecca Solnit asserts that “walking was [Wordsworth’s] means of composition. Most of his poems seem to have been composed while he walked and spoke aloud, to a companion or to himself” (Solnit, p 113). The outside form of the travel notebook seems to testify to the common conception of William, and, more generally, of the Romantic Poet, as the dreaming, solitary male musing in nature. Moreover, by considering this object in tandem with Solnit’s work, and Robin Jarvis’s 1997 study of the rise of pedestrianism in the Romantic period, one can understand William’s walking as part of a larger, radical move to explore the environment on foot. Jarvis explains that walking had been traditionally associated with poverty, unrespectability and possible criminal intent. Though attitudes were to change during the first few decades of the nineteenth century, the increasing number of people choosing to travel on foot across the 1780s-90s were met with considerable prejudice. Jarvis thus sees an element of ‘deliberate social non-conformism, of oppositionality’, and a desire to pave one’s ‘own ideological space’ in the actions of late 18th century walkers. Elsewhere I have argued for William’s active rebellion against the forces of modernisation dominant in his society, seeing The Excursion, in particular, as William’s poetic endeavour to offer an alternative social vision. William thus seems to fit in with Jarvis’s model extremely well, and it is intriguing to consider walking as an intrinsic part of William’s method of conceptualising. My previous reflection on the “slow, ponderous pace of Wordsworth’s The Excursion” (Tarrant, p 5) takes on new meaning upon reading Solnit’s claim that William’s “steps seem to have beat out a steady rhythm for the poetry, like the metronome of a composer” (Solnit, p 114). Comforted by the rhythm of his feet through environmental space, William apparently felt best able to access his ‘own ideological space’ and compose unique poetry. As a fellow student tentatively turns the leaves of the travel notebook, however, this idea of William as a solitary figure musing in nature is at once complicated. Within its scarlet cover lies the penmanship of many hands. Curator Jeff Cowton explains that the first hand is Dorothy Wordsworth’s, inking a fair copy of Samuel Coleridge’s ‘Christabel’. After several pages, and only part ways through ‘Christabel’, Dorothy’s handwriting stops. Abruptly, we are greeted with scribbled drafts and fragments penned by William. Jeff alerts us to the pin holes piercing these pages, indicating that this section was once stitched up. Following on from this, Mary Wordsworth’s hand resumes the work of inking ‘Christabel’. The inside of the travel book thus represents a meeting place for many voices. The space it evokes becomes one of domesticity, of talking and collaboration. The individual voices ring out in tangible, discernible styles, seen in the varying shapes and slants of the different handwriting and the blots of ink embodying different pressure and grasps. One page catches my eye in particular. An otherwise ordinary page with lines of neatly written poetry beginning half way down it; the page is made notable by a mesh of wild lines scribbled in circular motion, its focused web subsuming a third of the page, with looser, thinner lines sprawling off the edges. Jeff suggests this is the work of the Wordsworth children, gleefully drawing on the left-out notebook. In my mind the picture shifts; William’s solitary musings are rejoined with a chorus of other voices. The voices of his loved ones aid and inspire his creativity: he carries these voices with him as he wanders, composing drafts afoot, and he returns to them to “write the result down later” (Solnit p 113). As a signifier of collaborative space, the inside of the travel notebook upsets the dominant conception of William as a solitary, self-obsessed figure. As Solnit quotes, William’s contemporaries recognised his focus on the self, with essayist William Hazlitt claiming “he sees nothing but himself and the universe”. Solnit echoes this view, over 150 years on, remarking that William’s “seems a remarkably impersonal life, since he remains reticent on his personal relationships” (p 106). Yet, this faded crimson notebook seems to testify to the importance of personal relationships to William, connecting him to a culture of community, sociability and collaboration. The incorporation of Coleridge’s ‘Christabel’ within William’s notebook further contributes to this conception of the importance of collaboration to William’s creative process. It seems likely that William flicked over Coleridge’s lines whilst musing upon his own. Coleridge’s verse hugs William’s ‘work towards’ famous titles like ‘The Prelude’ and ‘The Ruined Cottage’; I wonder: what might be gained from reading these poems in dialogue with ‘Christabel’ – in replica of their first formation? The placement of William’s drafts, encircled by Coleridge’s completed text, tangibly evokes the idea that poetry has no finite end, even when published. Coleridge’s verse, enmeshed in this space of literary creation, becomes part of the creative process once again. It sparks ideas in another creator’s mind, illustrating that spaces are never singularly marked off, but are always overlapping. This object appeals to me in a way that even the unanimously revered first-edition copy of the Lyrical Ballads did not. Seeing and handling this object is so unlike the way I typically encounter Romantic period texts. Whether this is through an anthology or a website online, I normally blindly accept the text’s materiality, anaesthetised through repeated encounters with an authoritative presentation – standardized fonts; exact, uniform line spaces; each pristine word confidently declaring its aptitude to stand in the final, publicised version of that text. 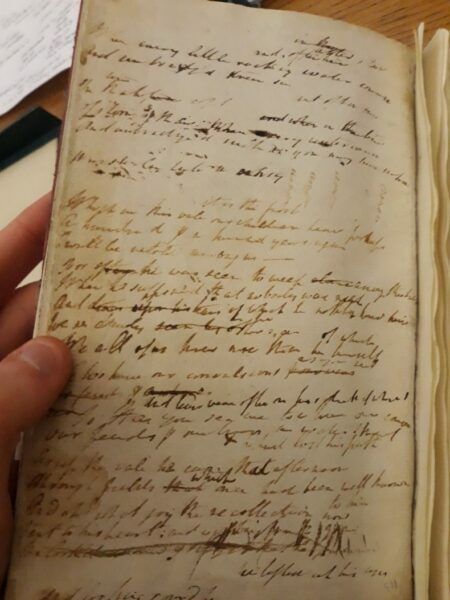 In contrast, the material presence of Wordsworth’s travel notebook is impossible to ignore. The human, living body, with its actively processing mind, positively leaps off every page. It is a place of testing and mistakes: countless words are scored out with varying degrees of vigour and thickness of line, replaced with better phrases which squeeze in between the lines above and below. It is a place for Dorothy Wordsworth to test her pen, writing ‘amen’ five times horizontally across a particularly intriguing page. Far from making this page unusable, William’s handwriting accompanies Dorothy’s: his poetic attempts fill the page, writing right up to, and around, Dorothy’s testing. Leafing through the notebook, we also see that several pages have been cut out with a knife, perhaps to be transferred elsewhere. These details contribute to the look and feel of the object as a kind of hodgepodge or patchwork, a place of creativity in action. It offers a rare glimpse into those half-formed first thoughts and inner musings that lie behind the finalised versions of William’s poems. To see William’s drafts is to glimpse at the person behind the idolised figure – a man drawn, perhaps, to the colour red, surrounded and inspired by family, friends and his partner. 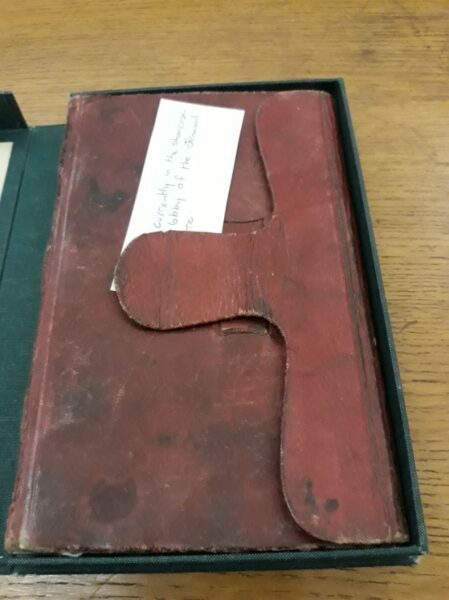 The relaxed, even rough, treatment of the travel notebook by the Wordsworths strikes a dramatic, almost amusing, contrast with our student group’s gentle, careful handling of the same. This item, having withstood violent scribbles and even the sharp blade of a knife, is now gingerly cradled by hands that apply the lightest touch to turning its pages. The passing of 200 years, and the reputation of its owners, has ensured the notebook’s status as an object of preservation. Quick musings and jotted-down thoughts become treasured inscriptions on a sacred text. I find myself wondering what William would think of this – of a group of students pouring over and dissecting his mistakes and drafts. It feels like an invasion of private space; this was not a text designed in mind for the public eye. Yet, it is for this very reason that the notebook has made such an impression on me – it evokes the human and imperfect, the work-in-progress rather than the finished product. It is, in fact, somewhat reassuring to see the author of so many magnificent works struggle at times to find the exact words he requires. It has been an encouraging thought whilst composing this paper: to imagine myself sharing in that experimental space of the red leather notebook. Rachael Tarrant holds a first-class honours degree in English Literature from the University of Glasgow. 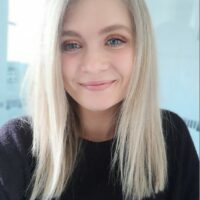 Rachael is currently pursuing her studies into the literature of the 18th and 19th centuries, and is especially fascinated by poetry and poetics. Compelling close-readings in particular bring her genuine joy and excitement, as does spending time with her boyfriend, friends, family and cats.